Now obviously if there is anything to come of this, it is in its early stages. I can speak for its authenticity. J Will responded to skepticism. A friend of mine works independently (out of his home) as an architect. I was over at his place and saw this picture on his wall (surely you can tell that the image I posted is not an original file, you can see the flash from my camera in the middle of the picture). I asked him what it was, and I've already shared nearly everything he told me with you guys. I don't know who it's for, what other firm(s) he may be working with, etc. What he told me is that it's a mixed use tower (the city wants some office space in new buildings this close to the financial district, as they're worried about running out of space for office buildings if nothing but condos are built), and would rise over 1000 feet. The other information he shared with me is that their may be some sort of connection under the train tracks to the GO Bus station, which is immediately to the north of this on the other side of the train tracks. I'm offended by the suggestion that because this hasn't been made public yet I am a liar. Throughout my post history, is their anything to suggest that I have the ability to fake a rendering of a building? I have just about the worst artistic, visual, and creative skills of anyone in the world. My friend told me that it was ok to share this picture, and I thought the forum would be interested. Had I known it would create this negative reaction, I'd have kept it to myself. If this isn't good enough, I ask that you just lock it instead of deleting it. If this, or a modified version of this ever goes to the city for approval, I want to be able to point to this thread. Like the design. If its true I'd rather have it further north. It would stand out on the skyline way too much this far south. You think so? From the West it would appear almost behind CN Tower, as well as Maple Leaf Square, which is also of respectable height. It would totally throw off perspective coming from the East as well as from the Islands, though. Must be one hell of a home office. After seeing nothing but badly designed high rises in the Middle East for two months, this is a nice change. I am not sure this does anything for me. It looks like a thin John Hancock. Looks great, but is it for real? I will believe it when I see the planning documents. However, I wouldn't mind a tower like that in the spot. i really like the design, and there's always been talk about a big commercial building on the site, but i'm skeptical as to whether this is a real proposal, or if it was just a fantasy drawing. they have to get rid of that parking lot. Could it possibly just be holding space for a smaller structure in the future? This looks like an exciting project. It's exactly the kind of thing that should be located on that site. I'd be thirilled if it turned out to be real. I just don't people on these forums who go crazy every time a rumour is posted. I can't understand why it makes them so angry. If I just wanted to hear about projects that were already released, I could read newspapers and the City website. The great thing about a forum like this is that we can hear little details before a project is announced. I received a package from CB Richard Ellis Limited back in May with that 'fantasy' rendering on it suggesting what could be done with the site. The site was for sale and to help promote the sale of the property a flashy rendering was attached to the front of the document. I posted something on this several months ago regarding the potential density for the site, but neglected to include the fantasy rendering simply because it wasn't actually a propsed tower. the east side of Bay Street in downtown Torontoâ€™s Greater Core (the â€œPropertyâ€). At 2.3 acres, the Property offers investors an opportunity to acquire a large, strategically located development property with outstanding access to transportation amenities and the Financial Core." 45 Bay Street is currently zoned for approximately 1.2 million square feet of office density. The size and strategic location of the Property support a wide range of uses and unique development opportunities. Bay Street is Canadaâ€™s most prestigious professional address and headquarters to the countryâ€™s top financial and legal institutions. The Property represents an ideal opportunity to purchase one of Torontoâ€™s premier development sites, with an enviable Bay Street address. Sales of high-rise condominium developments across the GTA have been trending upward year over year since 2000. In fact, builders that traditionally focused only on low-rise projects are beginning to favour high-rise development due to the shortage of low density residential sites. After peaking at 12.0% in 3Q 2003, Financial Core vacancy rates have experienced a sharp decline due to positive leasing fundamentals. Following a 610 basis point improvement, office vacancy rates are now at lows not seen since 2001. Declining vacancy rates, positive absorption and increasing fundamentals are projected to continue. The availability of developable land inventory across the GTA in general, and the subject Property in particular, is rapidly declining. The Provinceâ€™s Greenbelt legislation has severely restricted land supply and development opportunities across the entire region. Recently completed, ongoing and planned residential and commercial development opportunities around the Property have further reduced development opportunities in the surrounding area. Over the past several years, ongoing development in the area surrounding the Property has led to further improved amenities and services for nearby residents and tenants. With additional commercial and residential developments in the area, in conjunction with immediate proximity to the Financial Core, Entertainment District and Harbour Front all support the Propertyâ€™s anticipated success under a variety of development scenarios and uses. LOL. What a load of John Hancock. Though I like the design. 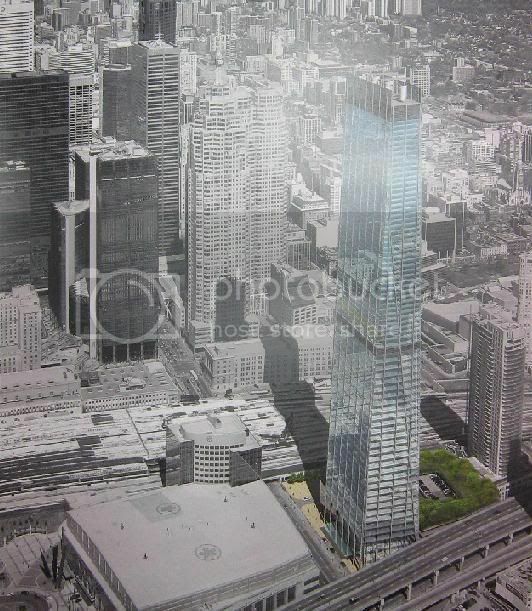 Though we're going to get, of course, a green glass semi-curved tower, or a cheap podium and precast tower. You heard it from me first.